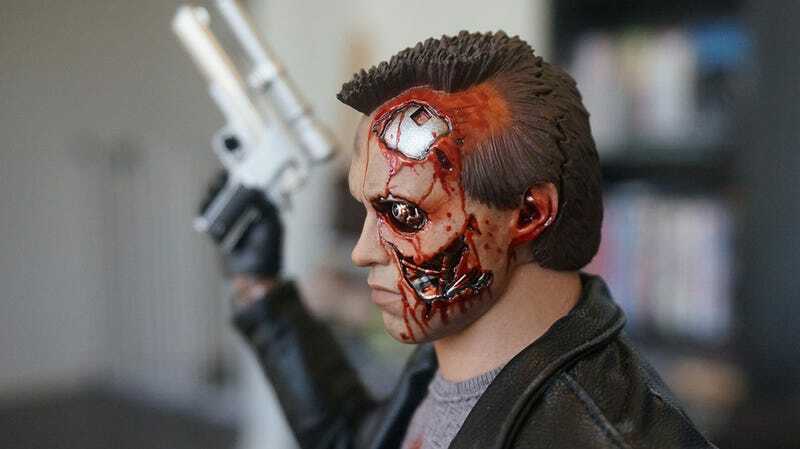 Having done Terminator 2 a while back, Hot Toys have turned their exposed, blood-covered robot eyes towards James Cameron's original sci-fi classic. What they've come up with will not stop until your wallet is dead. The figure, an extra head, some hands, a pair of sunglasses, a base and four weapons. The likeness is something we take for granted with Hot Toys figures, but that doesn't make it any less exceptional here. This isn't a "decent likeness", this is a tiny little Arnold Schwarzenegger you can put on your shelf. As weird as it is to highlight "gore", the blood here looks great, both on his chest wound (which looks genuinely wet) and his two damaged heads. Adding in so many weapons is a nice touch, because between the heads, hands, sunglasses and guns, you can replicate a pose from almost any major point in the movie. I'm not sure whether it's the proportions of the figure itself or the clothes, but he looks kind of...doll-like. Like something's not quite right about the size of his legs or shoulders. A more dynamic pose will mask this, but if you're just going to stand him up straight, he's going to look like Barbie's Ken had a real bad day. NOTE: You can tell it's October, the busiest month of the year for us, when I call a classic 1984 sci-fi movie a "game" towards the end of this video. The figure sells for $230, and is available from Sideshow.